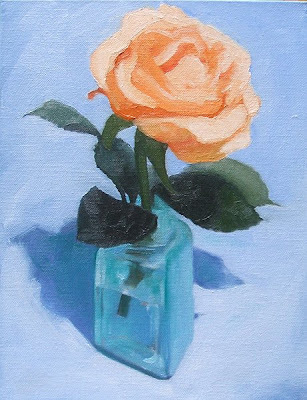 Rose I 12" x 9" Oil on Stretched Canvas $285. The lovely rose cost $3 at Cleveland's Westside Market. I got MANY great shots of it in various settings and I'm looking forward to painting it again. It's amazing to me that you can start and complete a WHOLE (oil) PAINTING in one day. (Color pencils take SO much longer!) I'm not 100% happy with this one, but will tweak it later. I want my paintings to look "effortless and painterly." -- Inspiring examples of seemingly "effortless & painterly" can be found here: Carol Marine, Jeremy Lipking & my old friend from LA, Chase Chen.